When we last left Adventure Girl, she was settling in Erwin, TN. Her plans were to enjoy a 0-mile hike day by watching a marathon of movies – VHS style. VHS stands for Video Home System. VHS predates DVD and Blu-Ray players. Ask your parents, if you don’t understand. Just remember, there is no such thing as a stupid question. In fact, while keeping up with Adventure Girl’s travels, I had to ask “What does slack-pack mean?” In a minute, I’ll share that answer with you. 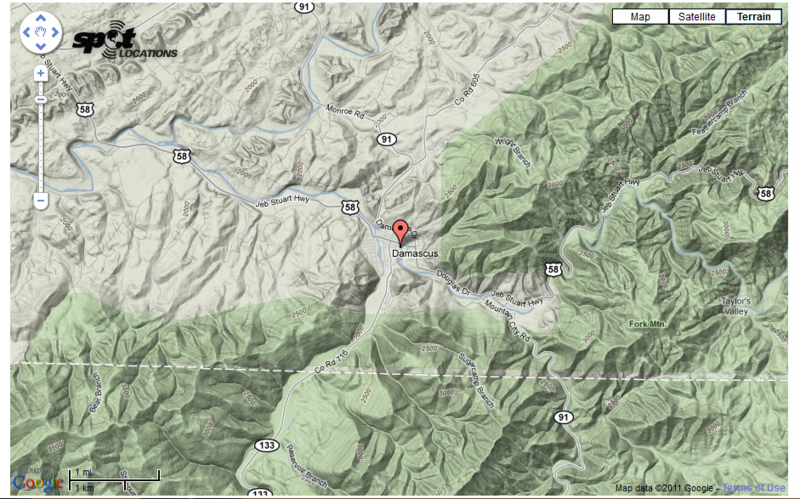 Adventure Girl's location as of April 9, 2011. First, let the record show, Adventure Girl’s preplanned Mail Drop locations put her in Damascus, VA on April 14th. Readers, start your engines. Wait. Sorry. Readers, check your calendars. Today is April 9th. Our Adventure Girl is making some serious time and putting some serious miles behind her. Let’s give it up for Adventure Girl! Youth is a wonderful thing, eh? Over the course of this past week, Adventure Girl traveled from Erwin, TN to Damascus, VA. Folks, Adventure Girl traveled 115 miles in a week. Do the math. (Seriously, I’m not good at math. You do it.) She covered approximately 16 miles a day! However, based on her journal, she traveled 28.7 miles one day and 17 miles another day, so clearly the calculator I used is broken. Suffice it to say, Adventure Girl is ahead of schedule and continues to pound the trail at lightning speed. Adventure Girl was spared the lightening and thunder, though the winds proved enough of a challenge. The rain arrived later that night, but she had already hunkered down in the shelter, so she dodged the wet stuff. That is until morning, “We awoke to snow. Yup it went from 80 degrees to snowing the very next day. TN is such a bi-polar place with a serious lack of privies.” I love her line about TN being such a bi-polar place. Adventure Girl is a hiker extraordinaire, as well as a budding writer! As I mentioned earlier, this week’s journey ended in Damascus, VA. Adventure Girl spent the night in a cabin obtained by her parents. My brother and his wife drove up to Damascus to spend one night with their Northbounder daughter. As her journey takes her further north, quick visits from her family will become few and far between. Still, my money is on Adventure Girl. Finally, what does slack-pack mean? Slack-pack is defined as hiking a section of a trail without a fully loaded backpack, giving the hiker the option to carry only what s/he needs	for a typical day hike. During her hike this week, a hostel owner agreed to slack-pack the gang over Roan Mountain. The gang left non-essentials at the starting point of the day, and the hostel owner met the gang on the other side of Roan Mountain with the left non-essentials. Adventure Girl – what a slacker! There is no point, just a turkey. I’ve been wondering about her, and was glad to see the update. But my feet hurt just reading this. Thanks for checking on her. I’ll return with an update on Adventure Girl next Saturday. In the meantime, RICE. Rest, ice, compression and elevate. Here’s hoping your feet recover in time to hurt again. Thanks Lenore for keeping us all up to date. Katherine is truley amazing. What an incredible journey! Twenty-six miles in one day? It sounds like she’s doing something so many of us have wanted to do but never actually done. I’m with you, though: A 0-mile day sounds lovely. Twenty-six miles in one day. Yes. Amazing. She also had a twenty-eight mile day. Youth is a wonderful thing. We are so proud of Adventure Girl and her incredibly journey. I just keep hearing John Denver songs in the background, but that could be residual migraine stuff. Some people really make good use of their (her) youth. I did not. Stop. Are you a John Denver fan? Please say ‘yes’, or lie and say ‘yes’. ‘Yes’ is the correct answer. I saw him in concert just before he died. (Seeing him in concert after he died would have proven difficult with the whole ‘live in concert’ concept.) I’m not sure if coming out of a migraine with a residual affect of John Denver serenades is a good thing in your mind. Again, please see my initial comment. You moved pool boxes around today? Just to knock the dust off? That’s funny. Sometimes, that’s how I dust. I move the items to the dusty area, leaving a clean spot visible. I think the random shapes of clean is a giveaway that I didn’t really dust.